As of 5 February 2013, 22:00 UTC/GMT, Student Volunteer applications for SIGGRAPH 2013 are CLOSED. Applicants will be notified of their volunteer status by 30 April 2013. We regret that we are unable to any accept late applications. Thank you for your understanding. Applications for the SIGGRAPH 2014 Student Volunteer Program will be available in November 2013. 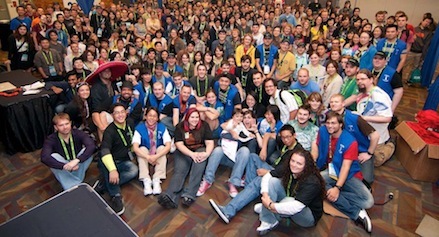 In the meantime, we invite you to take a look at the SIGGRAPH 2013 For Volunteers page to explore other areas that are looking for dedicated volunteers, including a link to the SIGGRAPH Conference Volunteer Form, if you are interested in serving on a conference committee for a future SIGGRAPH conference. You can also connect with your local SIGGRAPH chapter, which can be a great resource and a fantastic way to network with others throughout the year. And lastly, the application for the SIGGRAPH Asia 2013 Student Volunteer Program will be available in March 2013. With hopes that one day you’ll pay off that massive student loan? But just don’t know where to start to get to such great heights? A world of opportunities awaits you as a SIGGRAPH Student Volunteer! Are you left-brained or right-brained? Do you analyze, strategize, and mathematize? Or do you create, imagine, and feel? If you have a volunteer spirit and a passion for graphics, you might just transcend both! Join our team of Student Volunteers at SIGGRAPH 2013 and share in a celebration (or “cerebral-ation”, as I like to call it) of ideas from left and right-brainers alike! The SIGGRAPH 2013 Student Volunteer Program puts you right in the middle of all of the action, and deep into a network of fellow students who, just like you, are inspired to be the industry leaders of tomorrow. As a Student Volunteer, you will help support the conference and have the opportunity to meet and learn from professionals, creators, educators, visionaries, and each other. Students who demonstrate leadership, service, and a passion for computer graphics are encouraged to apply! Don’t miss YOUR chance to experience a synergism of ideas spanning computer graphics and interactive techniques. What better way to begin your contributions to the computer graphics industry? Volunteering for this experience is a no-brainer! Hope to see you in Anaheim in 2013! Applicants must be 18 years of age or older (on or before 20 July 2013). Applicants must be high school, undergraduate, or graduate students enrolled full time for at least one semester during the 2012-2013 academic year (Summer 2012 – Spring 2013). Due to the high volume of applicants, we regret that we can not accept any late applications. Please comply with the submission deadlines and ensure that you submit your application by the appropriate day and time. We cannot make any exceptions for students due to miscalculation of the application deadline. Thank you for your understanding. Only open to students who have previously served as Student Volunteers. Please complete the regular Student Volunteer application and the Team Leader essays on the application by 22:00 UTC/GMT. (Convert to your time zone.) Team Leader application results will be sent on or before 4 February 2013. Applicants will receive email notification at the address you provided in applications. Please adjust your spam filter so that any messages from siggraph.org email addresses will not be placed in your junk-mail folder. Applicants who are not accepted as Team Leaders will still be considered for Student Volunteer positions. The Student Volunteer application must be completed by 22:00 UTC.GMT. (Convert to your time zone.) Please note that you will be required to upload proof of full-time status (valid student ID, transcript, or proof of enrollment, etc.). We recommend that you allow ample time to gather this information from your institution before the due date. Otherwise your application will be marked as incomplete. You will receive email notification at the same address you provided in your application. Please adjust your spam filter so that any messages from siggraph.org email addresses will not be placed in your junk-mail folder. Accepted applicants who applied for travel or housing assistance will receive notifications at the same address provided in the application. Please note that students who receive travel or housing assistance will be required to increase their hour commitment from 25 hours to 30 hours. Those who do not receive housing assistance will remain 25-hour volunteers. Please be advised that funds are limited, and neither of these awards is guaranteed. Please adjust your spam filter so that any messages from siggraph.org email addresses will not be placed in your junk-mail folder. Commit 18 or 25 hours (approximately) of volunteer service to the conference (you can specify this on your application). Students who apply for 25 hours of service are eligible to apply for Travel and Housing Assistance and may also be eligible for special prizes and incentives that are not available to 18-hour volunteers. Saturday, 20 July 2013 (location and time will be announced in July). Please plan your travel to arrive in Anaheim NO LATER THAN NOON on 20 July, so that you will be able to check in before this mandatory meeting time. Depart the Anaheim Convention Center no earlier than late evening (after 6 pm), 25 July. We recommend that you stay until Friday, 26 July so you can celebrate a successful conference with your new SIGGRAPH colleagues on Thursday evening. Enjoy all of the sights and sounds of this amazing conference when you are off-shift! Hear top professionals in the industry (and former Student Volunteers) speak about tips, tricks, and job opportunities at exclusive “Student Volunteers-only” sessions at SIGGRAPH 2013! Polish that reel and résumé, and get some professional feedback to land that dream job! Space is limited. This program is made possible by the SIGGRAPH Student Services Committee (S3). You never know what’s in store! From special guests to prizes, we are always up to something fun for our hard-working Student Volunteers! In addition to the above benefits, 25-hour students are eligible to apply for Travel and Housing Assistance. They may also be eligible for special prizes and incentives that are not available to 18-hour volunteers. Volunteers who work at least 25 hours are eligible to apply for Travel and Housing Assistance to help defray the cost of attendance. Please be advised that funds are limited and neither of these awards is guaranteed. Still have some questions? Please review our Frequently Asked Questions. As of 5 February 2013, 22:00 UTC/GMT, Student Volunteer applications for SIGGRAPH 2013 are CLOSED. Applicants will be notified of their volunteer status by 30 April 2013. We regret that we are unable to any accept late applications. Thank you for your understanding. Applications for the SIGGRAPH 2014 Student Volunteer Program will be available in November 2013. Applications for the SIGGRAPH Asia 2013 Student Volunteer Program will be available in March 2013.